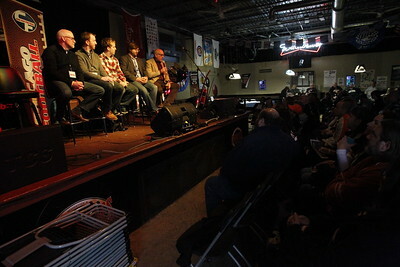 Matthew Apgar - mapgar@shawmedia.com Greg Gabriel, former Bears Director of College Scouting, looks over the crowd as he and a panel of experts discuss the upcoming football draft on Saturday, April 25, 2015 at Offsides Sports Bar and Grill in Woodstock. 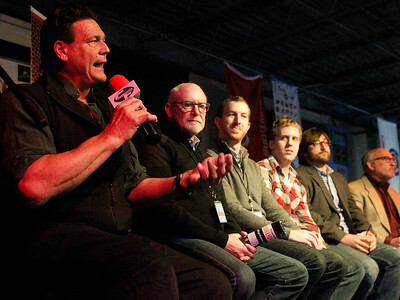 Matthew Apgar - mapgar@shawmedia.com Chicago Bears football great and 1985 Super Bowl champ Dan Hampton, left, talks draft prep with (from left:) Greg Gabriel, Kevin Fishbain, Nate Atkins, Arthur Arkush, and Hub Arkush on Saturday, April 25, 2015 at Offsides Sports Bar and Grill in Woodstock. 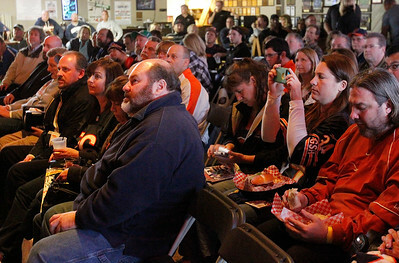 Matthew Apgar - mapgar@shawmedia.com Fans watch and ask questions to a panel of experts regarding the upcoming football draft on Saturday, April 25, 2015 at Offsides Sports Bar and Grill in Woodstock. 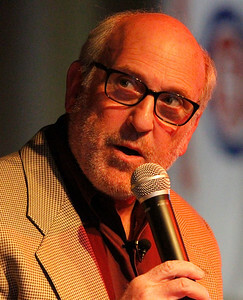 Matthew Apgar - mapgar@shawmedia.com ChicagoFootball.com General Manager Hub Arkush answers questions regarding the upcoming football draft on Saturday, April 25, 2015 at Offsides Sports Bar and Grill in Woodstock. 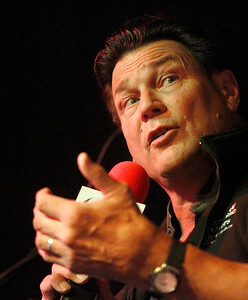 Matthew Apgar - mapgar@shawmedia.com Chicago Bears football great and 1985 Super Bowl champ Dan Hampton, left, talks draft prep with a panel of experts and fans on Saturday, April 25, 2015 at Offsides Sports Bar and Grill in Woodstock. 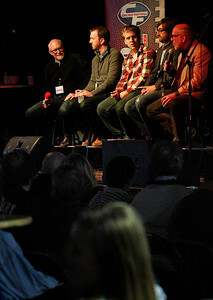 Matthew Apgar - mapgar@shawmedia.com A panel of experts, including (from left:) Greg Gabriel, Kevin Fishbain, Nate Atkins, Arthur Arkush, and Hub Arkush discuss the upcoming football draft on Saturday, April 25, 2015 at Offsides Sports Bar and Grill in Woodstock. 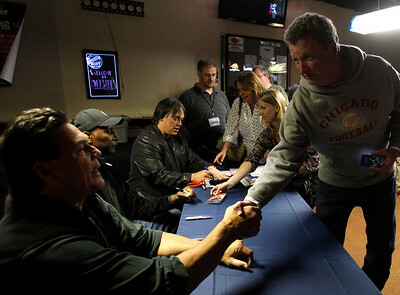 Matthew Apgar - mapgar@shawmedia.com Matt Palek of Woodstock, right, shakes hands with Dan Hampton as he and fellow Chicago Bears football greats and 1985 Super Bowl champs Otis Wilson, second from left, and Steve McMichael, center, meet with fans and perform in their band Chicago 6 on Saturday, April 25, 2015 at Offsides Sports Bar and Grill in Woodstock. 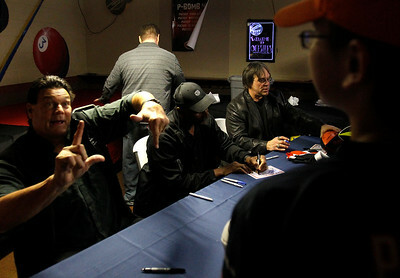 Matthew Apgar - mapgar@shawmedia.com Ryan Palek of Woodstock, 13, right, talks with Dan Hampton, left, as Hampton and fellow Chicago Bears football greats and 1985 Super Bowl champs Otis Wilson, center of table, and Steve McMichael, right at table, meet with fans and perform in their band Chicago 6 on Saturday, April 25, 2015 at Offsides Sports Bar and Grill in Woodstock. 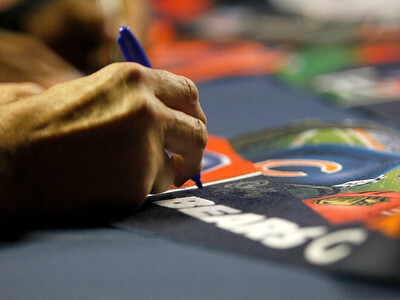 Matthew Apgar - mapgar@shawmedia.com Chicago Bears football great and 1985 Super Bowl champ Dan Hampton signs autographs for fans on Saturday, April 25, 2015 at Offsides Sports Bar and Grill in Woodstock. 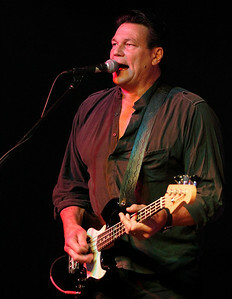 Matthew Apgar - mapgar@shawmedia.com Chicago Bears football great and 1985 Super Bowl champ Dan Hampton performs in the band Chicago 6 on Saturday, April 25, 2015 at Offsides Sports Bar and Grill in Woodstock. 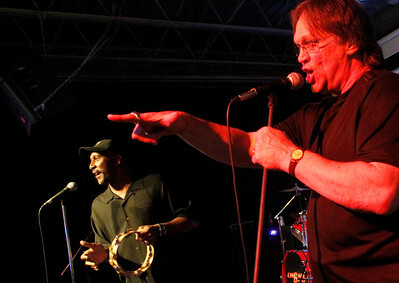 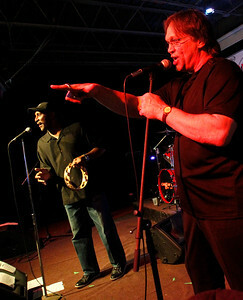 Matthew Apgar - mapgar@shawmedia.com Chicago Bears football greats and 1985 Super Bowl champs Otis Wilson, left, and Steve McMichael perform in their band Chicago 6 on Saturday, April 25, 2015 at Offsides Sports Bar and Grill in Woodstock. 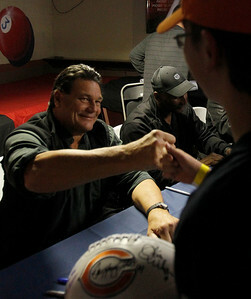 Matthew Apgar - mapgar@shawmedia.com Chicago Bears football great and 1985 Super Bowl champ Dan Hampton bumps fists with fan Ryan Palek of Woodstock, 13, on Saturday, April 25, 2015 at Offsides Sports Bar and Grill in Woodstock. 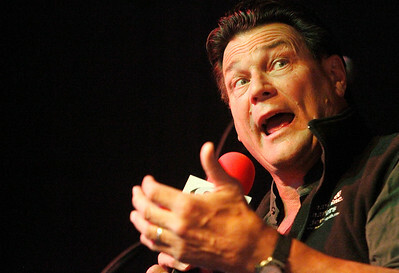 Matthew Apgar - mapgar@shawmedia.com Chicago Bears football greats and 1985 Super Bowl champs Dan Hampton, Otis Wilson, and Steve McMichael meet with fans and perform in their band Chicago 6 on Saturday, April 25, 2015 at Offsides Sports Bar and Grill in Woodstock. 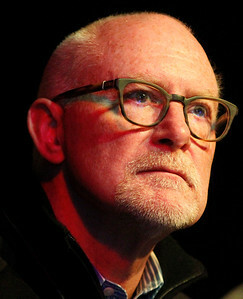 Greg Gabriel, former Bears Director of College Scouting, looks over the crowd as he and a panel of experts discuss the upcoming football draft on Saturday, April 25, 2015 at Offsides Sports Bar and Grill in Woodstock.